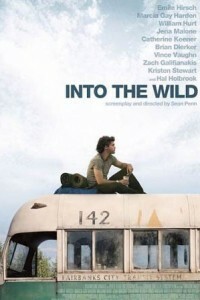 “Into the Wild” is based on a true story and the 1997 NY Times bestselling book by Jon Krakauer (who also wrote Into Thin Air and Under The Banner of Heaven). After graduating from Emory University in Atlanta in 1992, top student and athlete Christopher McCandless abandoned his possessions, cut up his credit cards, gave his entire $24,000 savings account to charity and hitchhiked to Alaska, where he went to live in the wilderness. Four months later, he turned up dead. His diary, letters and two notes found at a remote campsite tell of his desperate effort to survive, apparently stranded by an injury and slowly starving. They also reflect the posturing of a confused young man, raised in affluent Annandale, Virginia, who self-consciously adopted a Tolstoyan renunciation of wealth and return to nature.